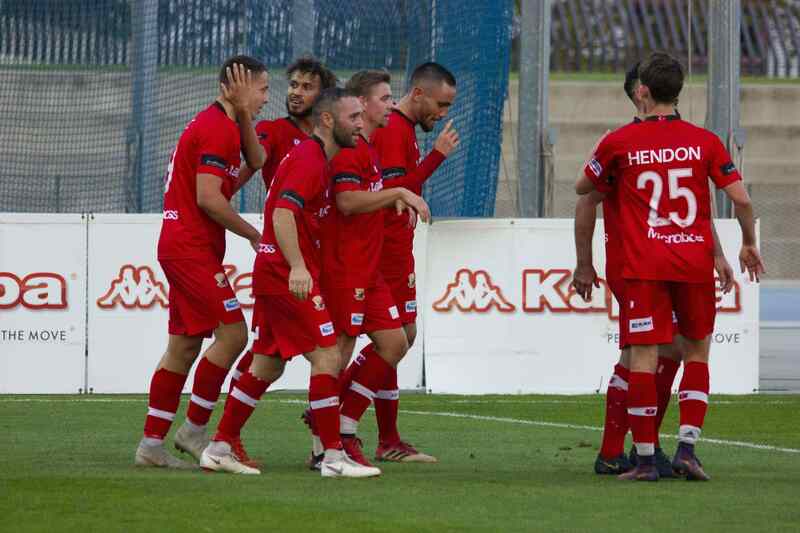 Hume City advanced into the quarter finals of the FFA Cup after eliminating former NSL giants Sydney Olympic 3-1 on Tuesday night at ABD Stadium. Two first half goals put Melbourne’s northern suburban club in front, courtesy of some neat finishing from Daniel Clark and Marcus Schroen. A second half surge from Olympic almost saw them challenge for an equaliser after a goal from Dimitri Hatzmouratis, but Theo Markelis put the result beyond doubt with a late goal. 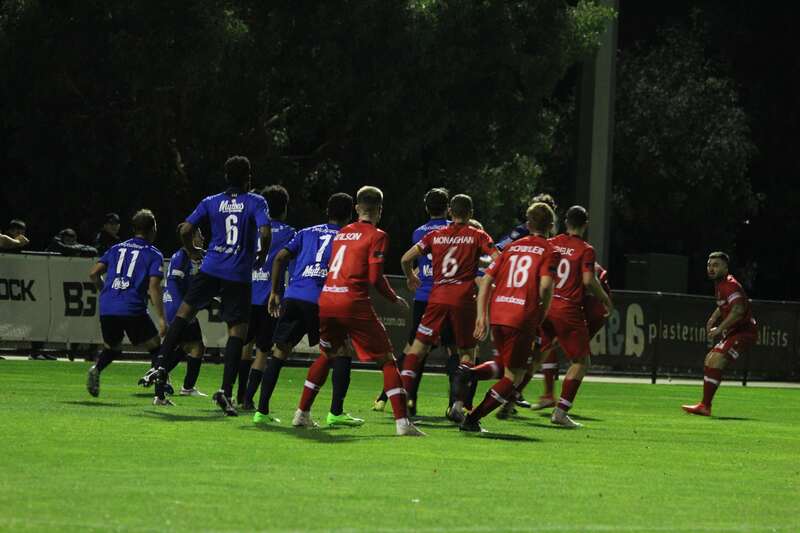 Sydney Olympic started the game with purpose, putting Hume City on the defensive from the beginning. Olympic’s speedy front man Dimitri Hatzmouratis was through on goal within first minute of the game, out pacing Hume’s youthful back line, but the attacker couldn’t find the target hitting his first time shot over the cross bar. Hatzmouratis continued to be a nuisance for the Hume defense, as he found room in the penalty area moments later. The Olympic man had a neat back heeled effort on goal, but ‘keeper Chris Oldfield saved comfortably. Olympic heaped on the pressure, this time Go Shirai ran down the flank inside the area before full-back Ivan Pavlak cleverly defended the danger. 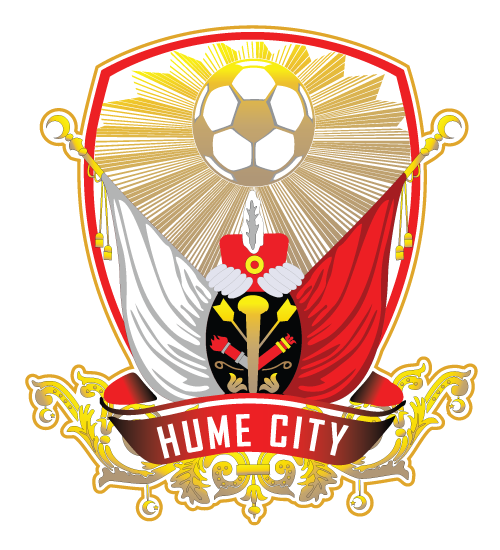 The lack of pace in the Hume back line proved costly when Hatzmouratis out ran Issy Erdogan to a long ball to find himself in on goal, but the attacker couldn’t find the target narrowly missing the far post. Hume began to turn the screws as the game progressed. Winger Theo Markelis drifted infield onto his right to curl a shot that almost crept into the far post. Olympic tried to get back control in the game, winning a set pieces near goal. Troy Danaskos whipped in the free kick finding Brendan Hooper but his header sailed over the crossbar. Hume hit Olympic on the counter with a deep run from Jai Ingham. The former Brisbane Roar winger burst down the flank to cut onto his left to shoot on goal. Olympic ‘keeper Paul Henderson palmed it away but put the ball into in the path of striker Clark who poked it in from two yards. After conceding Olympic went on the attack with Shirai pulling the strings to find Michael Gaitatzis, but in no time defender Shane Rexhepi was their to sniff out any potential flurry on goal. With half time looming Hume looked to consolidate their lead. Captain Nick Hegarty surged forward on the left flank with purpose to cut back a pacy ball into the area. After missing a few bodies in the penalty area Marcus Schroen ghosted into the box to grab the second. Olympic threatened to cut Hume’s lead in half after a few second half substitutes. Hume shot-stopper Oldfield came out to save substitute Tolgay Ozbey’s shot on goal but Hatzmouratis was there to pick up the loose ball to find the net. Hume searched for the sealer to put the game beyond doubt. The home side poured bodies forward to preempt the possibility of an Olympic come back. Shaun Timinis flooded forward to put in a cross from the byline. The full back cut a ball into the path of Markelis who placed the ball into the corner of the net. 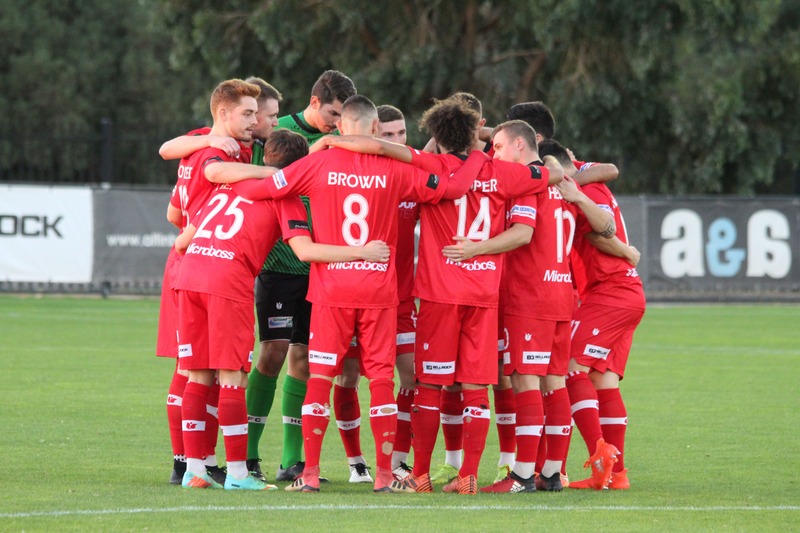 Hume City next Oakleigh Cannons in the quarter finals of the FFA Cup, further details to be revealed over the coming days.